When you work for a multinational or a bigger company, emails are your tasks, tickets and work timeline. Everyone emails anyone for anything. Some might even CC a mailing list or reply to all – bugger! Obviously we can all use chat channels and we have tools for that. We can blog and use forums internally, but email is that ‘ping’ that we do with other people. It’s also the method to make sure we commit people to something and address any important issue. I for one get all my corporate notifications on email, copy of my chat talks, updates, invites and news. It’s one huge mailbox for me to select and pick from. Now and then, these emails turns into heavy discussions, large threads and then someone suggests ‘let’s do a meeting instead’. Turning emails into meetings are daily tasks in a corporate world, which are also transpiring into startups and ‘lean & agile’ companies. So what I found out is that sometimes is better to call someone, discuss what you need and then email the results / outcomes. 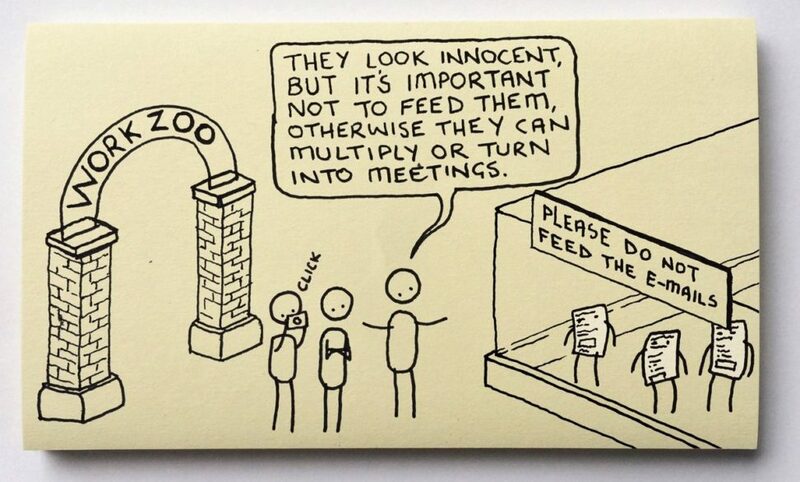 It avoids large meetings, misinformation and the “work zoo” described in the picture by InstaChaaz.